Title Card: In the late 21st century Earth was diseased, polluted and vastly overpopulated. "Piano Concerto No. 8 in C minor 'Pathetique' - Adagio Cantabile Written by Ludwig van Beethoven"
Q: Is 'Elysium' based on a book? Q: What is 'Elysium' about? 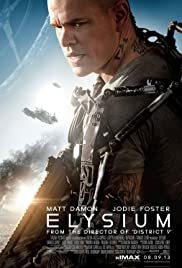 After director Neill Blomkamp's fantastic debut film District 9 I was understandably eager to see his new sci-fi film Elysium. Unfortunately his second feature doesn't quite match up with the greatness that was District 9. 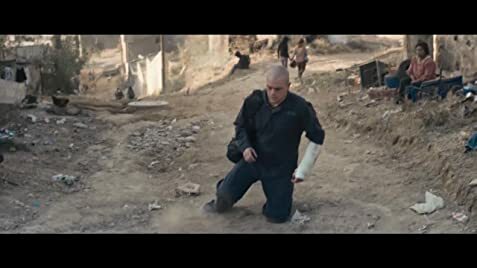 Matt Damon is decent as the film's protagonist Max who is an ex-con now working on assembling the droids which keep order on the now overpopulated Earth. His role and the writing of his character isn't anything too special or memorable but he does what he can with it. He's just a no nonsense guy who is thrown into a difficult situation. He was also quite sarcastic and funny when he was dealing with the droids in the earlier part of the film but we didn't see this side of him at all after that. Alice Braga plays Max's childhood friend Frey with whom Max meets up again when he's an adult. I didn't feel much of an emotional connection or chemistry between them though and that hampered the film a bit. Their back story is told almost completely in sentimental flashback sequences which I didn't care for. The antagonists in this film were very one-dimensional and over the top. Jodie Foster plays Elysium's defense minister Delacourt and Sharlto Copley (who was also in District 9) plays an undercover agent named Kruger who is positioned on Earth. They're both very cliché and uninteresting. The writing of all the characters wasn't very good at all in this film and I didn't get emotionally invested in any of them. 745 of 961 people found this review helpful. Was this review helpful to you?